While you’re still waiting on your refrigerator or your microwave to be as smart as your phone, the car in your garage is already ahead of the curve. If you own a vehicle made after 1996, you can connect to it with a simple device called an OBD-II adapter and find out your fuel efficiency, diagnose check engine lights, and gather a ton of other useful data. Most cars manufactured since the 80s have an on-board diagnostics (or OBD) computer inside. These computers allow mechanics and regulators to troubleshoot any computer-controlled parts of the car. From January 1st, 1996 onward, all cars sold within the US were required to have an OBD-II compatible port. This allows anyone with an adapter to read information from the car. You may have seen this when a technician checks your emissions. For the most part, OBD-II tools were only used by professionals to do things like figure out why you check engine light is on, or to make sure your car is meeting emission standards. However, OBD-II ports can be used to read a lot more helpful data. 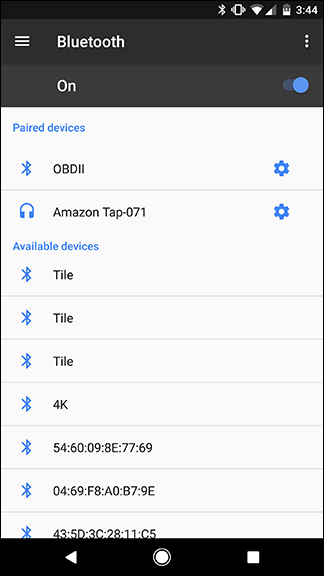 Recently, cheap Bluetooth adapters have made it possible for everyone to get access to that information. While this might all sound dry, everyday consumers can do a ton of cool stuff with even a cheap OBD-II adapter. You can buy a basic Bluetooth adapter for as little as $20, though there are more expensive ones that offer even more features. I own this one which is $22 on Amazon. With it, you can connect to apps like Dash (Android/iOS) and Torque (Android). It’s important to note that many of the cheaper Bluetooth adapters may drain the battery if they’re left plugged in. These should be okay as long as you drive your car every day (or if you’ll only plug it in when you want to diagnose a check engine light), but if you leave your car idle over the weekend, you may want a more high-end adapter. See how much your trips cost in gas. You probably know off the top of your head about how much it takes to fill up your tank. But how much does it take to drive to work? How much do you spend every time you drive across town to see a friend? Apps like Dash track how far you travel, compare that to the cost of gas in your area and how efficient your car is. For each trip, it can show you how much you spent to get there. It’s weirdly comforting to see that each trip to work costs $0.40. Diagnose your check engine lights. The check engine light can mean any one of a hundred things are wrong, and you’ll never know until you go to your mechanic…unless you have an OBD-II adapter. Apps like Dash and Torque can give you a more specific error code. Sometimes the app can tell you exactly what that means, or you can Google it for more information. With this information, you can figure out whether you need to hurry to the mechanic right away, or if you just lost your gas cap. Remember where you parked your car. Basic adapters like the cheap ones listed above can connect to Dash and use your phone’s location to mark where you parked your car. When you leave, you can track it down from your phone. If you’re using Automatic Pro, it can locate your car even when it’s away from your phone. So, if a family member uses your car (or if it’s stolen), you can track exactly where it is from your phone. Get help from emergency services. This one alone may justify the cost of Automatic Pro. This adapter can detect when you’ve been in a severe car crash. An operator will then call your phone and ask if you need assistance. If you say yes (or if you don’t respond), they’ll call emergency services for you and send them to your location, which Automatic can also see. Their operators will also stay on the phone with you until emergency services arrive. Connect to IFTTT, Alexa, and other smart apps. As if these tools weren’t powerful enough on their own, you can pair them with your host of other smart home gadgets through IFTTT. There are IFTTT channels for both Dash and Automatic that let you log check engine lights, turn your lights on when you get home (or turn them off when you leave), or send your partner a message when you leave for work. Automatic can also connect to Alexa so you can ask where your car is or whether you need to get gas. That’s a lot of power for a basic diagnostic system from the mid 90s. If you want to add your car to your arsenal of smart home gadgets, you don’t need an expensive head unit or a brand new car. The cheaper Bluetooth adapters are an easy way to get started if you just want to dip your toes in, though Automatic offers a lot of benefits that you don’t get from generic OBD-II adapters. Once you’ve decided which type of adapter you want to use, you’ll need to plug it into your car. The OBD-II port on your car looks like this. The port may be in different places depending on your model of car, but it’s legally required to be within two feet of the steering wheel. Usually, it’s just underneath the wheel, or near the fuse panel. Once you find it, plug the adapter in like so. Next, open up your phone. Most adapters will use Bluetooth, so you’ll have to pair it to your phone. This process may be slightly different for each phone, but we’ve detailed the process for most devices here. 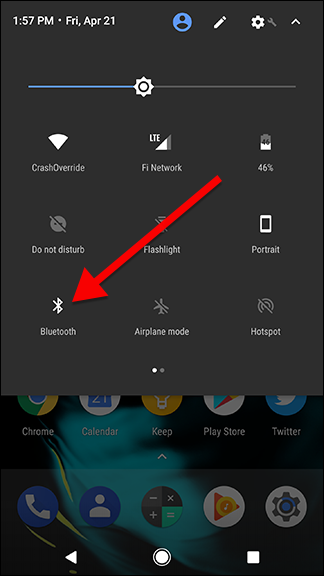 Start by heading to your Bluetooth settings. 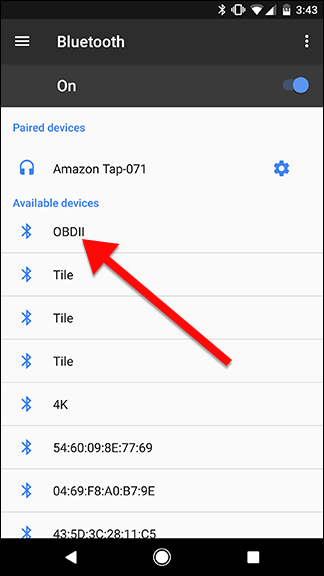 Find the OBD-II adapter in the list of devices and tap on it. You’ll then be asked to enter in the four-digit PIN for your adapter. You can find this in the instructions that came with your adapter, but as the prompt says, it’s usually 0000 or 1234. 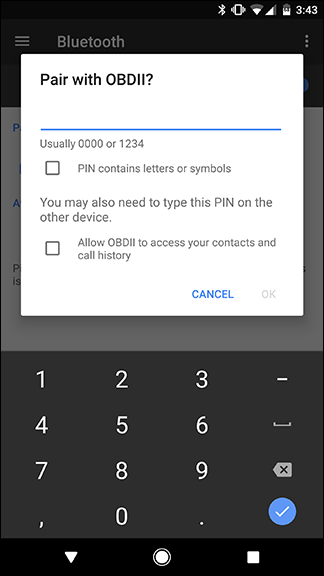 Once you’ve entered the PIN, tap OK.
You should now see your adapter in your list of devices. You can now open up your various OBD-II apps we mentioned earlier connect to your car. We recommend Dash in particular for logging information about your car and tracking your trips. Automatic Pro will have a different set up process, since it uses 3G to track your car rather than Bluetooth, but Automatic Lite should work just like any other Bluetooth adapter.